Raimundo Luis Ferreira is a PhD candidate at the Faculty of Sports Science and Physical Education, University of Porto, Portugal. Ramiro Rolim PhD, is an Assistant Professor at the Faculty of Sports Science and Physical Education, University of Porto, Portugal. He is a former coach of middle and long distance runners. The world's best performance for the men's marathon has regularly stood for long periods but in recent years, it has been regularly improved. At the same time, the focus of training methodology for long-distance runners has shifted from high volume workloads to workloads of less volume combined with higher intensity. In an effort to understand the changes, the authors examined training methodologies employed by the coaches of top-level male marathoners. Using a combination of face-to-face interviews and analysis of published training programmes, the authors studied twelve coaches from five countries (3 Brazilians, 2 Spaniards, 2 Italians, 1 Mexican and 4 Portuguese) whose athletes have achieved excellent results in international competitions. They conclude that there is no straightforward relationship between the training methodology of less volume with high intensity and better results, given that 50% of the coaches studied use high weekly volume workloads and high intensity and 50% of the coaches use a lower volume and high intensity. Under the influence of successful Australian and New Zealand schools of distance running, coaches around the world generally increased the training volumes of their marathon runners throughout the 1950s, 1960s and 1970s. Given the favourable situation that the number of available competitions was lower and the races that existed were not as aggressively commercialized as they are today, it was possible to develop high volume training programmes that included enough time for recuperation. From the 1980s onwards, the numbers of marathon and other road races and the number of participating athletes have steadily increased. There have also been developments in sport science, especially in the areas of training methodology and biomedicine. We have seen substantial improvement to the world best performance in the men's marathon, particularly since the late 1990s (Table 1), and the number of top-level athletes has increased. 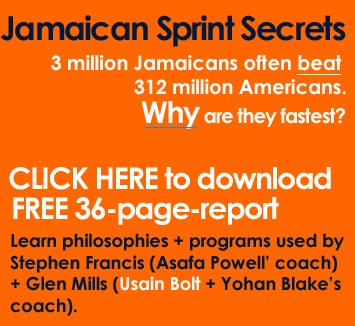 The 2:06:50 mark of da Costa (BRA), which remained as the world's best time for 10 years (1988-1998), was improved three times in five years and has so far been exceeded 35 times by 25 athletes. To compare the best results of the athletes in order to find out if they correspond to a training methodology that favours lower volume and higher intensity. For decades, the Australian and the New Zealand middle and long distance running schools had a strong influence on coaches all over the world. 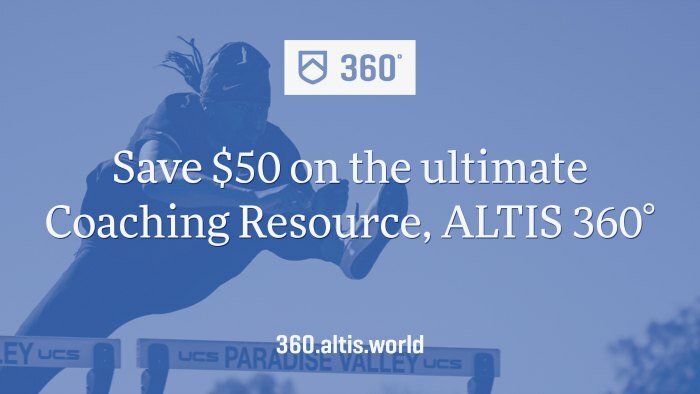 The two schools shared certain characteristics including training in nature, high volume loads, a dynamic progression of the workload, the exploration of the psychological resistance of the athletes during long runs, and a reduced number of competitions. Table 2 recalls some of the main characteristics of Arthur Lydiard's New Zealand school, which was considered highly innovative at the time. From the 1980s, the discussion of the importance of volume, and in due course of intensity, in the training of elite long-distance runners, including marathoners, has intensified. KARIKOSK (1985) emphasised, although with no specific reference to the marathon, that the best results by long-distance runners have been achieved with varying volumes of km/week. However, the author called attention to the fact that athletes who accomplish higher volume workloads usually have a greater number of injuries during the year. An increase in training volume, therefore, does not necessarily guarantee better results. In the same line, COSTIL (1986), in a study on two marathon runners who had interrupted their training programmes for six months, observed that the athletes achieved their highest values of oxygen consumption with a workload of between 80 and 120km per week. NOAKES (1986) concluded that athletes who train with an average of between 150-200km/week achieved the best results in long-distance competitions, including the marathon. KLEM (1989) affirmed that elite 10,000m runners should train at a medium weekly workload of 150-200km but said that elite marathon runners require a higher workload of about 200-250km/week. Some years later, WILMORE and COSTIL (1994) questioned the conviction of many coaches who believe that improvements in aerobic resistance are proportional to the training volume. According to the researchers, high volume should not be considered the most important stimulation factor for better muscle adaptation. Other studies confirmed these doubts about high volume training. At the end of the 1990s, the critique became general. SMIRNOV (1998), for example, illustrated the exaggerated training volumes used by Russian athletes, who sometimes trained at double the number of kilometres per week of the most successful athletes of the time. In the late 1990s, researchers also started to engage with the question of volume in a more complex way. SKAH (1997) and EVERTSEN (1998). for instance, analysed runners from Morocco and Kenya, who are well known for the high quality of their aerobic training, and came to the conclusion that they train at a medium volume of 160200km/week. BENSON (1998) pointed out that many Kenyan athletes can count on an enormous background (up to 52,000km) accumulated from their infancy to adolescence, which in its majority is attained in informal training. Therefore, these athletes have a very well developed aerobic capacity at the beginning of their sports careers. According to the author, this finding should influence coaches to employ a progressive increase in volume for young athletes in general. BUENO (1999) stressed the problem of the growing commercialisation of marathon and other long-distance races and the resultant high level of prize money. The author found that the financial incentives have created a temptation to over-race and overtrain, both of which increase the stress on the athletes and the possibility of injury. TJELTA and ENOKSEN's (2001) research, based on three elite runners who obtained excellent results in international competitions including the marathon, showed that all three trained at a medium volume of about 155-160 km/week and that their training could be characterised as being of high quality. However, there are authors who remain in favour of high volume training. STEFFNEY (2001) relates the increase of training volume to the improvement of the athlete's performance and recommends that elite marathon runners use a weekly volume of 200-250km, but with fewer competitions. (3) an interest in the training methods of famous Latin schools (Spain, Italy, Mexico, and Portugal). Concerning the Brazilian and Portuguese coaches, the information about their training methods was obtained through face-to-face interviews during the year 2001. The training methodologies of the other six coaches were analysed from their published training programmes. As can be observed in Table 4, in relation to the periodisation developed by the coaches studied (Alonso 1999; Canova 1998, 2000; Ferreira 2002, Ferrero 1999; Gigliotti 1991, Gomez 1996, Lenzi 1987, Pereira 1980, 1984) it is possible to observe that the duration of the different periods is quite varied, given that many athletes compete in different cross country, road and track races throughout the year. The main differences occur in the competition period, which can be between 4 and 13 weeks in the first cycle and 4 and 12 weeks in the second cycle. Table 5 illustrates that when it comes to means and methods, all the coaches apply duration methods in the three periods. The long extensive interval method is common to all coaches in the pre-competitive and the competitive period. The great majority of the coaches studied employ running technique and strength training in all periods. The medium extensive interval method and velocity training are only used in the pre-competitive and the competitive periods. With regard to weekly training volume, striking differences can be seen in all periods (Table 6). The lowest workload in the preparation period is 150kmjweek and the highest is 220kmjweek. In the pre-competitive period the loads used vary between 190 and 240km/week and in the competitive period the minimum weekly volume is 170km but can go up to 265km. Thus, in the preparation period there is a difference of 70km/week between minimum and maximum workloads used. In the pre-competitive period, the range is less but it is still 50km/week. The most remarkable difference can be found in the competitive period where it is 95km/week. There is a consensus among authors (BENSON 1998, EVERTSEN 1998, KARIKOSK 1985, NOAKES 1986, SKAH 1997, TJELTA and ENOSKSEN 2001, WILMORE and COSTIL 1994) that 160 to 200km/week can be considered is a medium volume for top athletes and greater workloads are considered elevated. Consequently, we can say that the great majority of the studied coaches employ medium volume (or lower in comparison) in the preparation and pre-competitive periods and high volume in the competitive period. The data in Table 7 is only approximate, since the volumes of each period were analysed in greater detail to be able to achieve to this conclusion. With regard to intensity, we will discuss the most important period, the competitive period. As can be seen in Table 8, the expressions of intensity for the three different paces of one of the duration methods (continuous running) vary remarkably between 30 and 45 seconds per kilometre, depending on the coach. While pace three (fast) varies up to 30 seconds/km, pace two (moderate) varies up to 45 seconds/km and pace one (light) up to 40 seconds/km. We will now look at continuous running in the competitive period. Unfortunately, one coach (Pereira) did not supply any data for this duration method. In order to evaluate the intensity of the continuous running we use the parameters established by LANDA (1998): light pace (s; 3:30 min/km), medium pace (s; 3:18 min/km) and strong pace (3:02 min/km). We call those paces within the parameters established by LANDA "medium", those that are slower we call "low" and those that are faster we call "high". It is possible to observe that the majority of coaches (7 of 11) employ levels of medium intensities for Pace 1 and 2 and almost the same number (6 of 11) use high intensities for Pace 3. It must be noted that the analysis of intensity in the interval training methods is rather complicated because most coaches choose very different distances for their training in the various periods. What is more, the density expressed in velocity divided by recovery is not a straightforward way of analysis, given that the recovery may be realised with a more or less intensive pace. Therefore, we only give one example for the long extensive interval training. The speed used for 1000m varies between 2:40 min/km and 2:55 min/km, which means that there is a difference of 15 seconds, depending on the coach. In relation to medium extensive interval training, the speed difference for 400m is up to 8 seconds. While the time of 1000m repetitions varies only between 10 and 15 seconds, the time difference in 400m repetitions used for medium extensive interval training is almost double with 14 to 26 seconds, depending on the coach. The density varies between 0.8 to 2.2 for 400m and 0.9 to 3.7 for 1000m, again depending on the coach. Starting from the most common values (not the average value but the value with the highest expression) of velocity and density, we consider the values above them as high intensity. In Table 11, it is possible to observe that four coaches train with high velocities (2:45 - 2:49 for 1000m) in long extensive interval training and five with high densities (2.8:1 - 3.7:1). For medium extensive interval training, seven coaches use high velocities (60 64 sec for 400m) and three coaches use high densities (1.2:1 - 2.2:1). We must note that these are only two examples of interval training methods used by all the coaches and that the overall results obtained by this study take into account all the different distances. In general terms, we were able to verify that 50% of the studied coaches (6 of 12) apply a methodology of a medium average volume of km/week with high intensity. The other 50% of the coaches use a methodology of a higher average volume of km/week with equally high intensity. 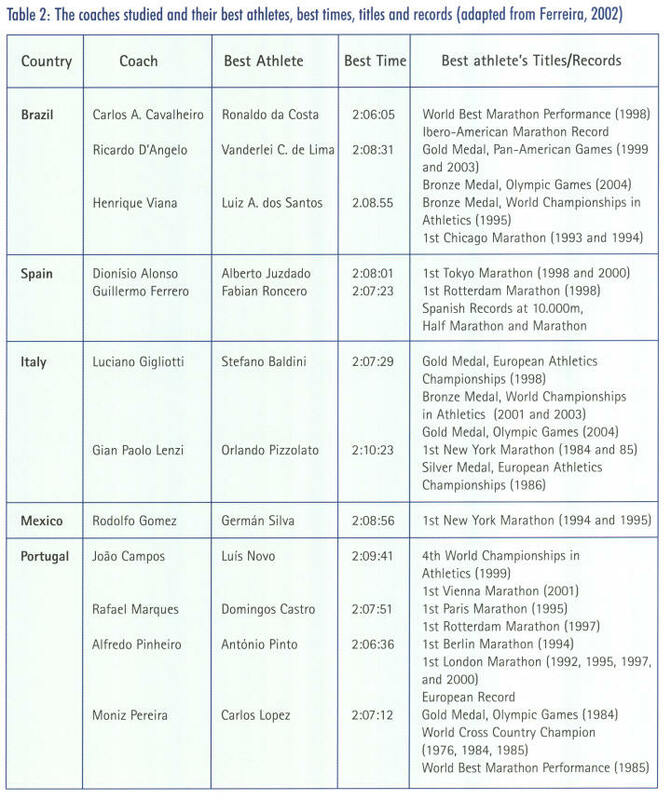 Examining the differences between countries, we can affirm that all Brazilian coaches employ a training methodology for marathon that is characterised by a medium volume of km/week and high intensity. One of the Spanish coaches uses a higher volume and an even higher intensity, whereas the second coach makes use of a medium volume and high intensity. Both Italian coaches use a high volume of km/week and high intensity. The Mexican coach, on the other hand, applies a lower volume of km/week and a lower intensity when compared to the other coaches. Three out of four Portuguese coaches employ a training methodology characterised by a higher volume of km/week and high intensity, while one coach uses less volume and less intensity when compared to the other coaches. It is important to mention that it became apparent during this study that the balance between volume and intensity depends on the level, experience and, most importantly, the individual characteristics of the athlete. We also observed that some coaches do not apply relatively new training methods (altitude training, strength training etc.) because they do not believe in their reliability or because they are captivated by previous models of success and believe their use is the only way to obtain excellent results. It is worth noting that these models were created in a specific time and context and usually have not been adapted to contemporary reality. The scientific advances that have occurred, mainly in the fields of biomedicine, biomechanics and training methodology, offer modern coaches the opportunity to amplify their knowledge about internal effects of the workloads on their athletes. Hence, they create the possibility to individualize the training methodology in terms of volume and intensity. Nevertheless, few coaches make use of this potential. Some say that they do not have access to the necessary equipment or the assistance of other professionals. We can further observe that the training methodology of high volume and high intensity dominates among the European coaches (1 Spaniard, 2 Italians and 3 Portuguese). In contrast, the Latin-American coaches studied favour a training methodology of medium volume and high intensity (3 Brazilians and 1 Mexican). We would like to close with a citation of the legendary long distance runner Emil Zatopek (quoted in JEANNOTAT, 1998) whose observation on training methodology in terms of volume and intensity seems to be still valid at present: "Today, I realise that quality is much more important than quantity, because it offers the possibility to obtain a superior level, and much faster. The athlete should be able to run quickly and for a long period of time and, thus, may achieve great results. In contrast, the training that focuses on quality is not easily accomplished by everyone. Moreover, there is another aspect to be remembered: in order to endure a training directed towards quality (intensity), it is necessary to have a perfect physical condition, which means to have an excellent endurance base. This is only possible if you have run many kilometres at a slow pace. In fact, the truth is to be found in the middle, and this middle varies from person to person."